This rather nice Harvest Moon-style game has finally updated, and it looks quite impressive. To be honest, it's probably the ONLY pony farming simulator under development right now, and that's one genre of game you don't see too often. So far, it seems to have really nice music, although I'd recommend that those fellows get some more practice at drawing graphics in an isometric perspective. If you're even remotely interested in this project, go on and check out the video above! 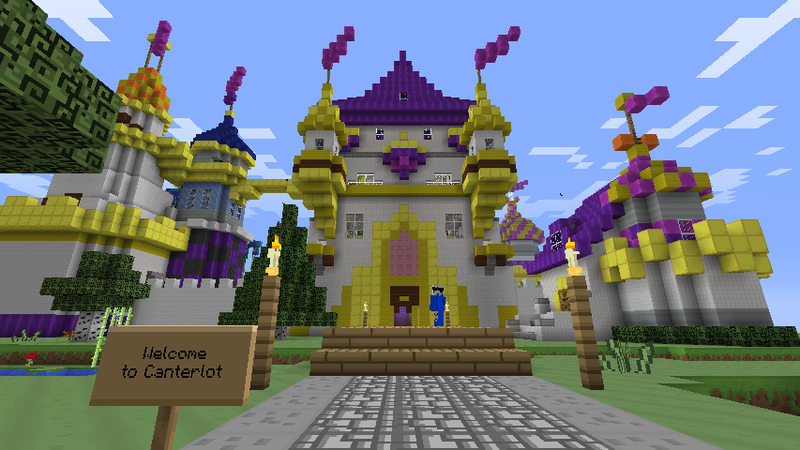 Over at the Brohoof.com Minecraft server they have recently finished an amazing, full-scale replica of Canterlot Castle, and it's stunning. Apparently it's been under construction since August, and they had a very large opening party (167 were on at the max, the most they've ever had). You can visit it by connecting to their server and typing /warp canterlot, and if you just feel the need to see some screenshots, you can find them in a nifty gallery after the break. Another pony platformer has been revealed (and an exceptionally good-looking one at that), this one starring the fictitious "Daring Do", and currently contains one demo level for framerate testing purposes. It's currently too short for a review at the moment, but once the author expands it a bit then we'll be most happy to review it, and it's still worth a play or two. Even though it is a demo for framerate testing purposes, "Daring Do Sidescroller" is still quite impressive, although the controls felt a tad bit floaty and the wild cats were animated rather choppily. Still, it has a great overall look, and the author actually implemented basic parallax scrolling, so let's hope he utilizes it to it's fullest potential for the game's final release. EXCLUSIVE:Information about MLP:RiM Season Two Edition! 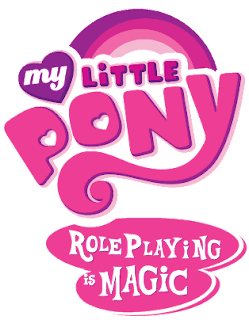 Remember that MLP pen & paper RPG we posted earlier? I recently got an email from the developers, and they gave me some exclusive information on the state of the Season Two rulebook, as well as some new features that should please the roleplaying crowd out there. More about the Season Two rulebook after the break! Edit:Livestream's over. Go on home, everypony! Remember, Mane 6 is having a livestream of My Little Pony:Fighting is Magic tonight at 8pm EST. Afterwards, they should have a recording up on Youtube, in case you miss it. When the time comes, grab some popcorn and sit down for a live display of the magic of fighting (eg, watching ponies beat the crap outta each other is great entertainment)! 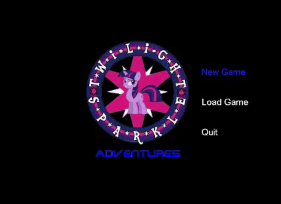 Some of you remember the post we made last month about a new pony RPG by the name of Twilight Sparkle Adventures. Well, now the game is out of demo mode and into beta mode. The game is still very similar to its demo, which included most of the content seen here. The beta adds the rest of the story line, as well as adding graphical improvements. For a full review of this game, I'd recommend clicking this link, as this post is just an announcement. If this game gets released fully, it will most likely be re-reviewed. Thanks, and have a good night! Our friends over at Mane 6 promised a while ago that they would do a second livestream to showcase their upcoming project My Little Pony:Fighting is Magic, and they've delivered on that promise. On Tuesday, February 21 at 8pm EST the livestream will begin, and the dev team will play a few matches, show the game's progress, and talk about the behind-the-scenes development process. If you are following MLP:Fighting is Magic's development this is a must-see, and even if you can't watch it live a recording of it will go up later. Remember folks, it's live at Tuesday, Febuary 21 at 8pm EST, and can be found on their livestream at http://www.livestream.com/mane6. For more information, you can see their blog post about it at http://www.mane6.com/2012/02/mane6-livestream-ii.html. The team behind MLP:Rise of Vicis (now calling themselves Negation Squared and with a Facebook page) are working on YET ANOTHER My Little Pony:Friendship is Magic fangame, and it seems to be a FPS. Now it's technically a mod since it's a Doom 2 WAD, but it will be able to be played without Doom 2, and as you can see it's still in a rather early state. They are planning on having deathmatch maps designed to look like areas in the show, new weapons and characters and a rather short single-player campaign with around 8-10 levels. There is also no set release date (as usual), in case any of you were curious. The developers of PonyKart have released another amazing video, showcasing some of their most recent changes to the game and some rather nice-looking concept art. It's quite interesting, and I must say that they are making great progress on their game. PonyKart is shaping up to be an amazing game, and I for once can't wait for it to be finished. Also, if you want you can compile it from source and play it, although it's not recommended as PonyKart is still quite buggy. You may remember the review of SOPA "PIPA" Filly Adventure that we posted on Equestria Gaming after Blackout Day in protest of SOPA and PIPA. Well this game provided the basis for that self-made parody. 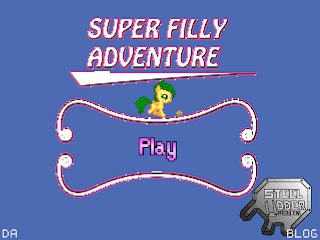 In Super Filly Adventure, you take the role of a filly named Jade on her mission to find her cutie mark. 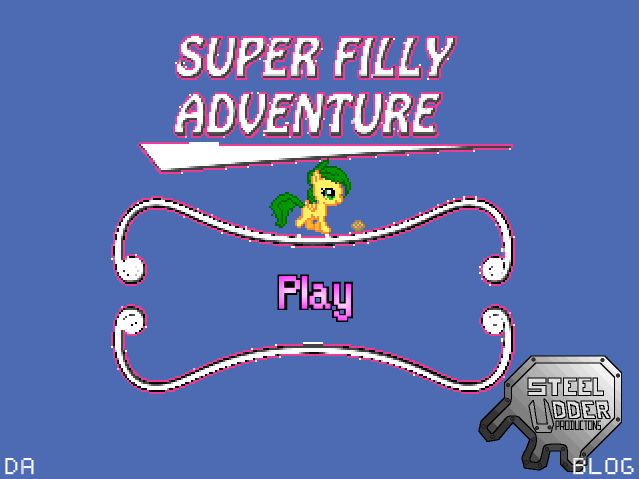 Jay6, the creator of Super Filly Adventure, originally created this game for the 16-bit Game Contest on Equestria Gaming that has since fallen by the wayside, unfortunately. This game has become very popular in its own right, however, and a proper review is necessary. Read it after the break! The fellows at Manestream Games have released a video update of their upcoming project, Cutie Mark Crusade:A Dash of Adventure. This update showcases Fluttershy's Cottage, as well as the music that will play inside it. It's not much, but I thought it'd be worth posting. There are a couple of brony-oriented social networks out there. I mainly use Rainbow Dash Network, and a good amount of Bronies use BronyNet. However, a new social network has popped up, and it's simply put, incredible. It's called Cloudsdale. To find out more about this incredible social networking site, check after the break! Well, once again the Humble Brony Bundle has begun, and we've decided that we are going to follow the event on Equestria Gaming! If I were you, I'd highly consider donating to them, as 60% of the donation will go towards charity, 30% towards indie developers and a 10% tip towards the fellows at Humble Indie Bundle.inc. Either hit up their website at humblebronybundle.blogspot.com, or use the donate button below!